This decentralized postpartum unit includes a nurse’s work station in the patient’s room. A postpartum unit is where healthy mothers and babies are transferred after delivery on an inpatient labor, delivery, and recovery (LDR) unit, and where they stay until they are discharged, between one and four days later. An emerging practice in postpartum care—known as rooming-in—enables the baby to remain in a postpartum room, with their mother, for a majority of the stay. The care provided in a postpartum unit is significantly different from other inpatient units in that staff care for two types of patient—mothers and newborns—with very different needs. For mothers, care is focused on pain management, rest, safe ambulation, and postpartum education, while babies receive basic cares around feeding, sleeping, diapering, and bathing. 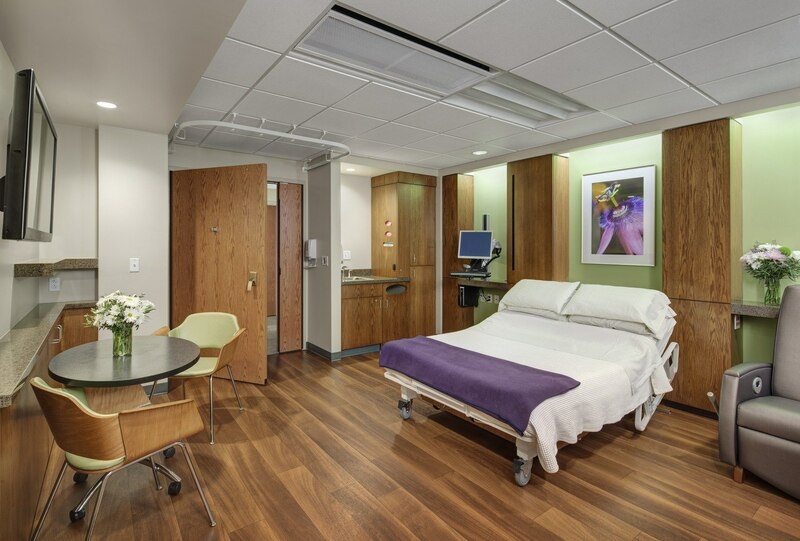 Postpartum patient rooms address these various care needs by creating separate zones to better accommodate night stays, baby care, and visitors. Effective clinical teamwork and staff communication are essential to the delivery of quality care in all types of inpatient units. The coordination and tracking of mother and newborn patients can become challenging while on a postpartum unit, making staff-to-staff and staff-to-patient communication especially important. Staff communication and teamwork have traditionally occurred in centralized spaces commonly known as nursing stations. More recent decentralized unit designs are characterized by several small charting stations located throughout the unit, along with dispersed locations for supplies and/or medications. Does Decentralization Support Postpartum Care? Despite a growing body of research investigating the impacts of centralized and decentralized unit designs on staff and patient outcomes, no such studies have been conducted in a postpartum setting. An HGA study, recently published in Health Environments Research and Design Journal, sought to address this gap in knowledge, and to understand whether decentralized unit design supports a postpartum care delivery model. The setting for the study was a newly constructed 11-bed postpartum unit, in a U.S Midwest hospital, that had transitioned from a labor, delivery, recovery, and postpartum (LDRP) model—where patients remained in one room throughout their entire stay—to a model where postpartum care was provided on a separate unit. The new unit had also transitioned from a centralized work environment to a decentralized work environment. The study utilized a mixed-methods approach and included unobtrusive shadowing and surveying of nursing staff to evaluate nurses’ efficiency (i.e., time spent in specific areas, activities performed, distance traveled, workflow patterns), and staff perceptions of the built environment (i.e., satisfaction with standardization and unit design features). Sound level meters were used to measure acoustical conditions on the unit, and pre- and post-move HCAHPS scores were compared to assess changes in patient satisfaction. These methods were selected because they reflected “metrics of success” defined by the project team during the pre-design phases of the project. Staff survey respondents were most satisfied with indoor environmental air quality in the new unit as well as the ability to interact with other staff, and proximity to supplies, patients, and team members. Dissatisfiers included limited workspace and high noise levels at the central charting station. HCAHPS scores for overall hospital rating, noise, and cleanliness increased significantly post-move compared to pre-move scores. Staff shadowing revealed that while five dispersed charting areas were available on the unit, nurses did not use them, preferring instead to use a small centrally-located charting area adjacent to the secure entry. Since nursing staff had come from a centralized environment, it was natural for them to continue operating as they had in the old unit, even though the new unit was designed to support a different workflow process. Implementation of transition and change management planning would have been beneficial in facilitating the alignment of new operational flows and the decentralized work environment design. Read the complete study by HGA’s Kara Freihoefer and Scott Lindvall, in collaboration with Sara Bayramzadeh, PhD, MArch, and Leah Hanson, BSN, RN, in Health Environments Research and Design Journal.